I have to admit that somehow I’ve wiggled myself into a good place. I am doing exactly what I want to be doing, I own the boat I have always wanted, and I’ve even fallen into an excellent job situation. Not just a good little company, but because Carroll Fulmer picked up a large contract just before I applied there, the specific fleet I was assigned to is perfect for me. They don’t pay the highest, but I get lots of miles and my schedule is uniquely flexible. Further, my boat is less than ten miles from one of the distribution centers I deliver to most often. I rolled into town early last Tuesday morning for a couple days off and jumped into boatwork. Tuesday and Wednesday were productive days; even though I had a dentist appointment Wednesday afternoon. Wednesday evening and Thursday morning were scheduled for working on my book. All went well even though after the dentist I had to backtrack to the marina to pick up my forwarded mail. UPS tracking showed it had just arrived. It was about 2.5 miles back to the marina and another mile back to the bus stop. All the while, I was eyeing the darkening sky. A large storm was forecast to bring heavy rain throughout the night. I was hoping to get back to the truck and off my bicycle before it hit. 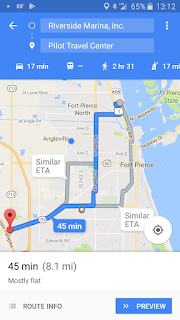 It is eight miles from the marina to the truckstop where I parked, and the bus does six of those miles for me if I time it right. the bus bike rack, it was barely sprinkling. I hopped on the bike and road through the damp streets, dodging the puddles and the rivulets along the curb. Back at the truck, I organized my thoughts, my mail, and the spare clothes I had stuffed into my saddlebags. The good news was that everything was dry after the downpour. The saddlebags had still been attached to the bike out on the rack in front of the bus. Looking back on my workdays, I had got some good work done. The cockpit was lifted out of the way, the fuel returns were installed into the new tanks, and the tanks themselves were set in place in the engine room. The trouble was the great hole in the deck where the cockpit had been. I had covered the aft third of the boat with a couple tarps that were onboard but one was already torn and frayed, and the other was too cheap and thin to survive the blasting wind of the storm that had just started. There is such a things as a boat sinking in the boatyard. A neglected boat will eventually develop leaks. My tarped Cape Dory, 6 yrs ago. 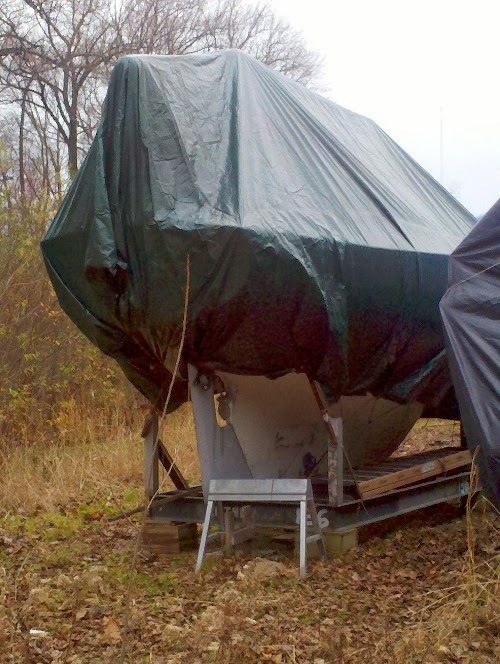 After a few years, the weight of rainwater in the boat can become too much for the cradle or the jack stands. Eventually, the whole thing will tip over or split open. Or more insidiously, fresh water can quickly rot any wood, structural or decorative, soaked by even a small amount. I had to come up with a plan. Thursday afternoon, after a nap, I headed for Savannah to pick up a load. 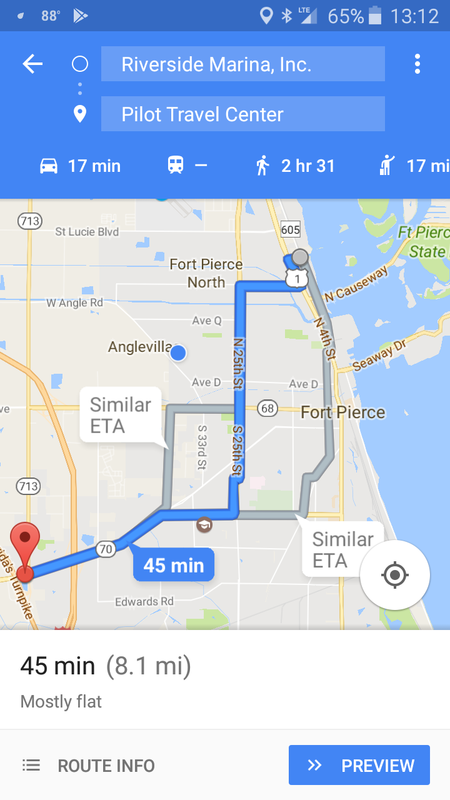 My next load was right back to Fort Pierce and as I headed down I-95, a plan began to come together. I needed good tarps and a bit of rope. My first Florida job last winter was delivering sod to Home Depots and Lowes. Hence, I knew right where there was a hardware store with a large parking lot, just off the highway. At Titusville, I jumped off and grabbed three tarps and 50’ of some cheap line. Down to Fort Pierce, I dropped my load, hooked an empty trailer, and cut across town to the marina. I have gotten away with parking my tractor and trailer for a couple hours at a time right next to a No Parking sign on a short, orphaned side street that goes downhill from the new Federal Highway to the Old Dixie Highway it replaced. If someone ever buys the empty industrial site here, my sneaky parking will likely come to an end. I grabbed the tarps, walked across the road and into the marina. 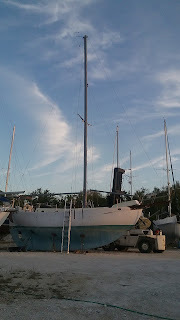 It’s almost June, the start of Hurricane Season, and the boatyard is filling up. So many boats lying akimbo like beached whales, completely out of their element. Right next to Emma, I met Dan, a friend of Captain Tony and Carol, whom I knew online until I finally met them ‘IRL’ here at Riverside Marina. Dan and I joked about endless boatwork and compared notes about our coming engine installations. He's trying to launch next week; I'm looking at next year. As expected, the storm I had barely escaped a couple days previous, had wrecked the cheap tarps over Emma’s cockpit. One had been slung over the boom like a tent, the other was draped over a storage tub laid upside down across the hole. The boom tent was shredded and water had collected in the lower tarp. The lower tarp, despite being tattered and baked by the sun, now held a couple gallons of water. As I gathered the folds of the tarp and gingerly attempted to lift it, water began running out of the raggedly porous tarp. Suddenly, a fold below my grip opened up and the water dumped into the boat but was caught in the tub that had fallen below. OK, not so bad. I lifted the tub and leveled it out the best I could to keep the water away from its rim. Just as I got it all to deck level, I discovered that someone had drilled in the bottom as it emptied into the engine room. Well, I got some of the water out. 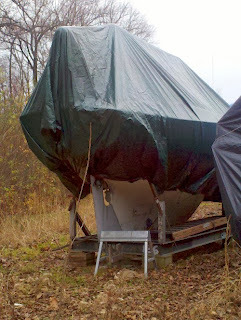 With the tattered and wet tarps gathered and pitched overboard down to the ground, I set about re-tarping. The two good heavy-duty tarps went over the boom as a double layer tent which I tied tight from the corners. The smaller lighter tarp was stretched across the cockpit hole and over the tub which gave some shape and slope to prevent water collecting. The previous lower tarp had collected water because it was not tied down, but laid across the tub with buckets in the corners. This time I tied it tight like a rain fly. Back on the ground, I gathered the old tarps and the trash to drag to a dumpster. I had forgotten my phone, so I have no picture of my handiwork, but I walked around Emma to evaluate her new storm readiness. After hitting the dumpster and hiking back out to my truck, I got out of my sweaty shirt and climbed in. I turned the key, the truck roared to life, needles on the various gauges sprung to attention and I was ready to hit the road again. The onboard computer showed I’d only been off duty for an hour and twenty minutes. Good quick work to secure my girl, Emma. I drove around the block and headed north again on U.S. 1, nobody knew or cared that I had made a side trip for my own project. Back toward Savannah and life is good. Sunrise on the Chesapeake, 2 yrs ago. I'll be back soon.